Need a speaker for an upcoming conference, workshop, or team meeting? Support your team or organization with an interactive lifestyle design training tailored specifically to your industry’s greatest challenges. Stacy Fisher, RDN, LD, CDE is a registered dietitian and lifestyle coach with more than 19 years of experience in the healthcare industry, where she’s worked in private practice, in medical facilities, and with large companies such as Dell, Boeing, and Nike. Choose a half-day or full-day training for any group size. Workbooks included. Signed copies of Uppward: A Self-Care System for Purposeful Living and The Self-Care Planner are also available upon request. 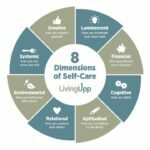 The 8 Dimensions of Self-Care – Understand how each dimension of self-care plays a role in your team’s health and well-being, both individually and collectively. Outline strategies that create more effective team environments and support goal achievement. Rate Your 8 – Learn how to assess your current lifestyle habits to identify where to invest your time and energy for the greatest impact. Find gaps and fill them in a way that fits your personal style. Self-Care Experiments – Discover your unique self-care preferences by mapping out experiments that best serve you, and maximize efficiency by choosing activities that support multiple dimensions. Designing a Lifestyle – Create a personal lifestyle plan that supports each of the 8 dimensions of self-care. Give your team or organization the tools they need to design a customized self-care strategy that helps them find more life balance, save money on healthcare, and experience more joy. For questions about training content, scheduling availability, or other details, please schedule a call with Stacy. Stacy has also been published in The Costco Connection and has spoken at events alongside well-known public figures such as Josie Bissett.